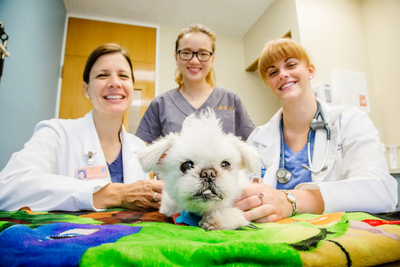 Dr. Katherine Kling and veterinary students Rita Chu and Nicole Andrews pose with Elliot, a senior rescue dog in treatment for a fractured jaw. The first time we see Elliot, he has a fractured jaw and a bad prognosis. He is a senior rescue dog. The family has only had him for a couple of years, but their 16-year-old daughter has given him his own tiny purple Mohawk hairdo. Clearly, he’s a keeper. 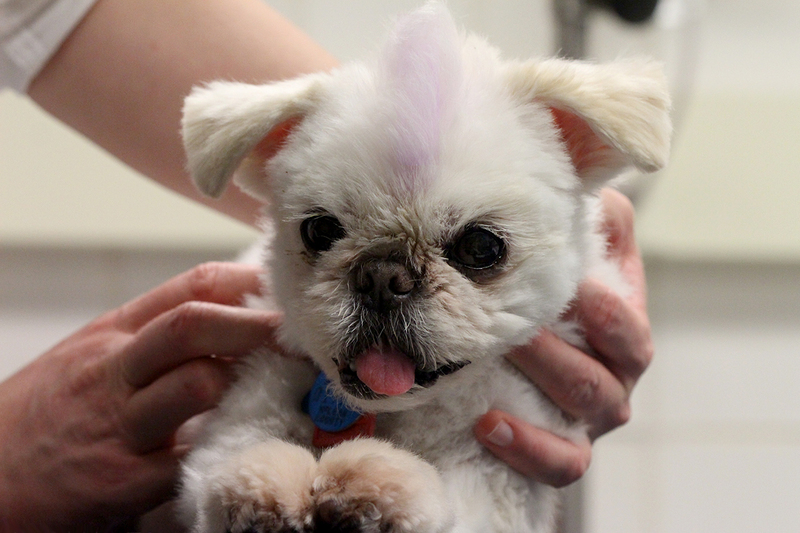 On his first visit to the clinic, Elliot rocks a pale purple Mohawk. The family isn’t sure how Elliot broke his jaw. They say maybe he took a spill off a table. But the dog has such severe dental disease that anything could have caused it. 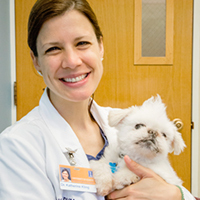 Many small dogs will develop advanced periodontal disease without routine dental care. Most of Elliot’s life, he did not have the benefit of the loving home he is in now. Even in the best of homes with otherwise good care, small-breed dogs are at higher risk of developing severe dental disease. They often start off with crowded teeth and inadequate bone surrounding the teeth. This puts them at higher risk for fracture. 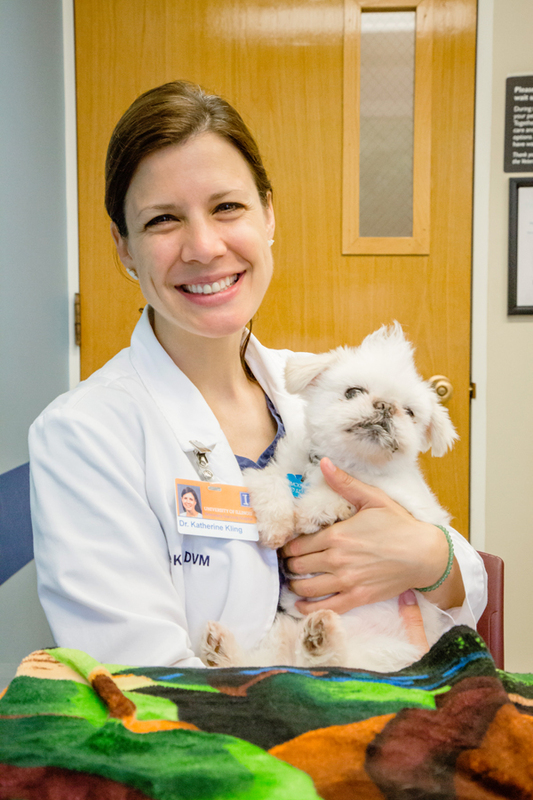 Today, Elliot seems calm and happy – despite the broken jaw. 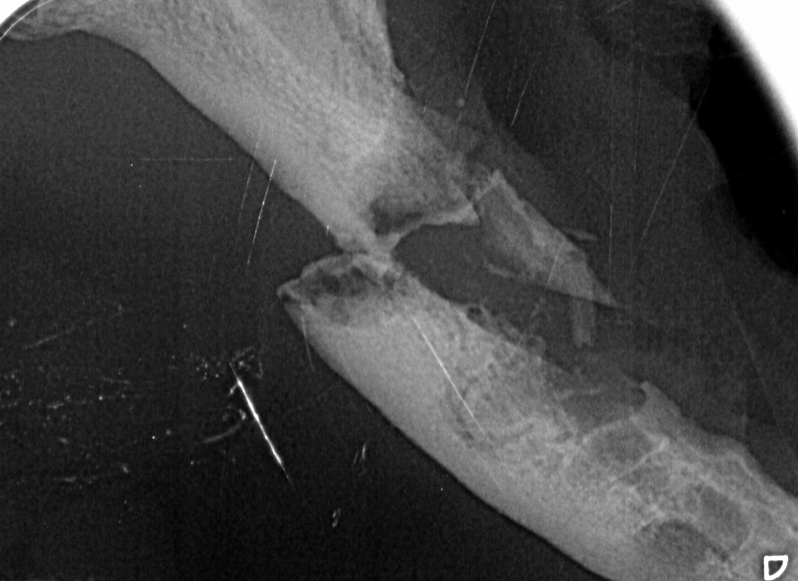 Imaging reveals fractures of both the right and the left mandibles. We take him into surgery. 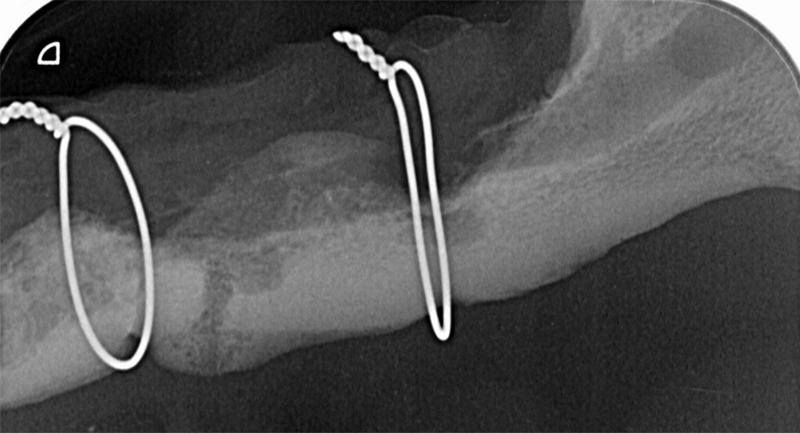 Usually in dentistry, we install interdental splints. This involves a wire scaffold between the teeth with an acrylic coating over it to make a hard splint all the way across the mandible. But Elliott has no teeth, so we secure a splint to the mandible with wire. The downside of this is it can cause some irritation to the bone. It’s a balancing act: We want to have the splint on for long enough to heal, but not a second longer, to minimize the irritation. Cerclage wire holds a splint in place while Elliot’s jaw heals. Four weeks later, Elliott comes back for a recheck. He’s still calm and happy. My students think this could be evidence of healing, but I remind them this is how he was when he first came in with the broken jaw – he just has a great personality. We decide to leave it on for another four weeks and check again. Twelve and a half weeks after his first visit, Elliot’s splint comes off. There is some bone loss associated with the splint, but overall, his mandibular fracture sites have healed. When I tell Elliot’s owners to keep him away from toys and hard foods for another six to eight weeks – to allow his jaw to heal and strengthen – they say this will not represent a change in his habits. The dog has never shown an interest in toys, he loves canned food and mostly prefers napping and cuddling. While he recovers from anesthesia, he sits on a student’s lap while she completes his discharge paperwork. Throughout this ordeal, I am more and more impressed with Elliot’s owner. We could have done some salvage procedures on the dog that would have been a quicker fix, but the best thing for the dog is to have that jawbone heal. I wanted to be able to provide that for this dog, but we couldn’t have done it without the owner. He made every decision based on what was best for Elliot, an elderly dog he adopted only two years ago.